or not, he did hold down a half-hour show on ABC for three years, starting Saturday, September 9, 1989. Parent Action Groups still wielded a lot of power at the time, mandating treacly-sweet shows like Care Bears and The Get Along Gang, so it was unusual to see a "hero" like Beetlejuice on the Saturday morning schedule of a major broadcast network. In fact, Beetlejuice was a harbinger of their waning influence, coincident if not connected with the waning influence of broadcast TV in general. Within a few years, prominent TV cartoons included Ren & Stimpy and South Park, both of which originated on cable, and neither of which is likely to have been approved of by the PAGs. Beetlejuice's cartoon was a continuation of his movie, where Michael Keaton (Batman) played BJ, which had come out the previous year. BJ was a ghost, a resident of the so-called Neitherworld, where everything was whacky and everybody could do anything. In the movie, he'd been hired by the recently-deceased Adam and Barbara Maitland to exorcise their house of the living family that moved in after their demise, Charles and Delia Dietz and their daughter Lydia, a goth. Critics have called Lydia (played by Winona Ryder) the only sane character in the movie, as well as the closest thing it has to a hero. Director Tim Burton (The Nightmare Before Christmas) is generally credited with having created the scenario and characters. In the cartoon, BJ was off on other adventures, with Lydia the only one from the movie, besides himself, to continue as an every-episode regular. Now able to travel at will between Outerworld and Neitherworld, she'd become friends with BJ, the only person she knew who understood her. 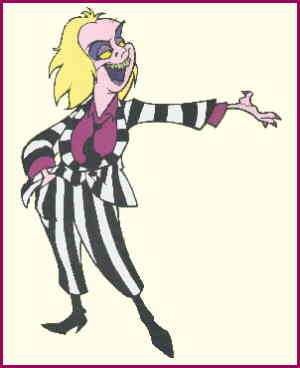 Beetlejuice's voice was done by Stephen Ouimette (Pompadour in Babar: the Movie) and Lydia's by Alyson Court (Jubilee in X-Men). In some ways, BJ of the cartoon was toned down from BJ of the movie, where he wasn't above out-and-out evil acts such as forcing Lydia to marry him so he could stay in the Outerworld. But in others, he was intensified. In the movie, he was on-screen less than 20% of the time, whereas in the cartoon he and the equally outrageous friends and acquaintances who come and go in the series were the main focus. He even spilled over into comic books, among other licensed paraphernalia — Harvey Comics put out a couple of issues in the early 1990s. The movie was produced by Warner Bros., which did the old Looney Tunes cartoons, but the animation was handled by Nelvana (Berenstain Bears, Eek! the Cat) the animation studio named after Canada's first superhero. Burton continued to exert influence on the cartoon. It ran three seasons on ABC, but they totaled only 29 episodes. However, simultaneous with the third season, Fox Kids (Mad Jack the Pirate. The Tick) aired a daily series of 65 original episodes, for a total of 94. Those 94 episodes are currently enjoying an afterlife in the form of video releases, which continue to sell briskly. Text ©2005-11 Donald D. Markstein. Art © Tim Burton.